Live streaming has been one of the big stories in sports media in 2016, and, when it comes entities in the forefront of live-streaming full games, colleges and conferences have been among the most willing to experiment. Included in that forward-thinking class is the Pac-12 Conference, which struck a small agreement with Twitter to live-stream nine games this fall sports season directly through the social giant’s API. The productions are completely handled by the schools, with crews from Utah, Arizona State, Arizona, and Colorado stepping up to the challenge so far. CU’s BuffVision accepted the responsibility of being the first to do the job, streaming a Colorado women’s soccer match vs. Oregon on Oct. 6. To support the school productions and to unify branding across all live-streamed productions, the conference mandated that all streamed games would be done under the brand “Pac-12 Plus,” regardless of the distribution method. The conference provided the schools with TV Graphics’ All In One laptop-based graphics solution, which creates a universal scorebug, lower-thirds, wipes, and other Pac-12 Plus branding. 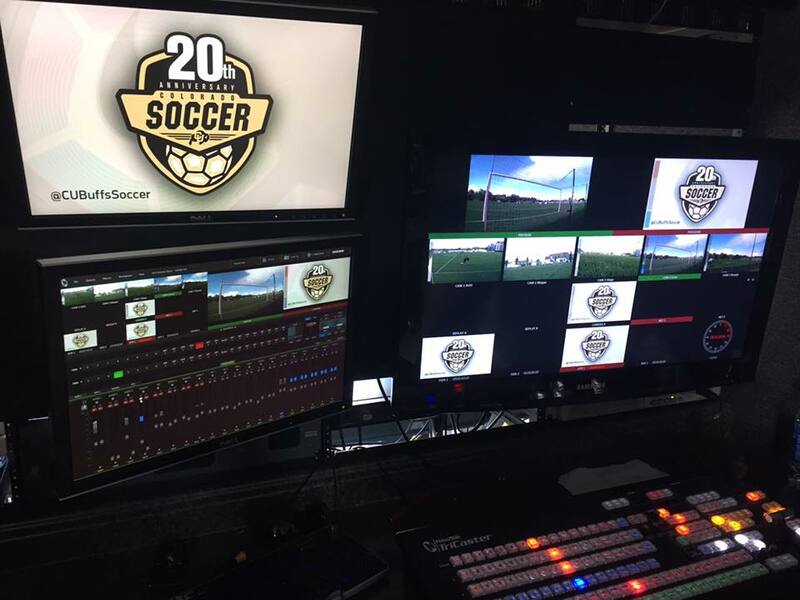 BuffVision rolled out its standard production complement for a soccer stream: three manned cameras feeding into a NewTek TriCaster production switcher and a NewTek 3Play for replay. The production was run out of BuffVision’s own in-house–built production trailer, and the crew comprised Pelloni as director/technical director, an engineer, a replay operator, the three camera operators, and an additional graphics operator to control the new TV Graphics setup.